A property priced at £500,000 has recently entered the real estate market in prime central London. Located in Mayfair, the two bedroom flat provides a rare opportunity for a young family or student to purchase a property in the area, or a buy to let investment opportunity for someone looking to expand their estate in the city. Mayfair has long been a desired residential location, with the typical resident regularly evolving. Recent years have seen house buyers getting younger, with new generations flooding to the area in search of first homes. The district has also attracted a wide array of nationalities and cultures around the world, with this changing inline with the location of the wealth. Due to the ever-changing global economy, the diverse community will continue to evolve and bring new cultures to the area. The prestigious neighbourhood inhabits a multitude of desirable qualities one could ask for in a residential town. With monumental garden squares, such as Hanover Square dating back as far as 1719, providing a safe a green environment, and historic architecture dating back to 1618, the neighbourhood offers ample charm and character. The West End district and Luxury Quarter are within the neighbourhood vicinities and provide a flourishing tourist economy, as well as local revenue. Research has shown local spending to be twice that of tourists in the Luxury Quarter, which consists of some of the top retail brands around the world, located on the high streets of Bond Street and Albermarle Street. The prosperous wealth and demand in this area have led to the presence of retailers expanding to adjacent high streets in the quarter. Home to some of the most expensive properties in London, and in fact the United Kingdom, Mayfair was expected to say goodbye to properties priced below £1 million shortly, according to a prediction made in 2016 by Mayfair estate agents, Wetherell. In 2016, less than five percent of properties on the Mayfair real estate market were valued below £1 million, with zero priced less than £750,000. At the other end of the scale, 11 percent of properties were valued over £10 million, and the majority were priced between £1 million and £10 million, with 41 percent less than £2 million and the remaining 48 percent asking for between £2 million and £10 million. The prediction of the £1 million property extinction was likely, considering the trends of the market, and may still come to light. However, a recent addition to the market has disregarded the trend and is priced at only £500,000. 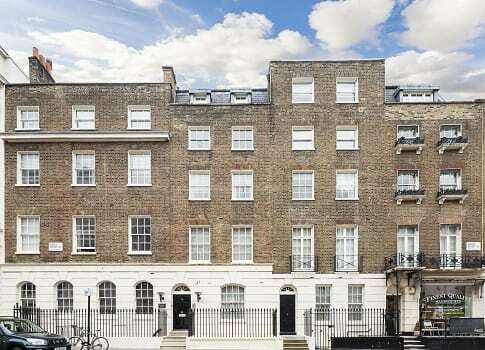 A modest asking price for a two-bedroom property in Mayfair when compared with the average £4.6 million house price and £2.8 million average for a two bedroom flat. Located on Davies Street, nearby iconic 5-star hotel Claridges and excellent transport links, with Bond Street and Oxford Circus tube stations minutes away, the flat is ideally positioned. Originally a terrace of Georgian houses built between 1824 and 1827, the converted property is situated in Erskine House. At 956 square feet, the flat offers open plan living spaces, a separate kitchen, two bedrooms, and a large storage room, located on three floors. A private garden shared between residents, modern foyers throughout, and the original exterior intact result in demand from younger home buyers looking for charming character and modern luxury combined met in this ideal first family home. The 12-year lease on the property may be an alarming factor to some potential buyers. However, the purchase price over 12 years equates to £868 a week, which compared to the £1,300 weekly average is a saving of £432. Across the 12 years, this £432 equals a saving of £269,568, and with an estimated cost of £150,000 for a standard Grosvenor 20 year lease, extending the property lease will still leave the future homeowner with savings from the purchase 32 years down the line.